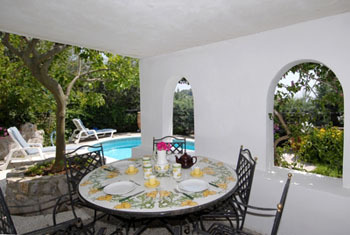 The villa surrounded by greenery and flowers having a private swimming pool, overlooks the enchanting bay of Nerano. 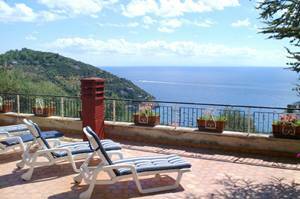 From the large private solarium reached by steps one can enjoy a breath-taking sea view. 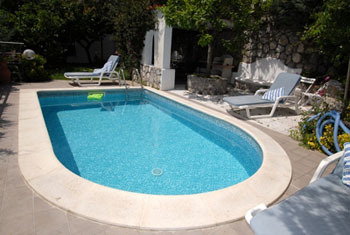 Sought after by companies for accommodating their employees for short holidays, this villa is at a distance of approximately 250 metres from a grocery shop and pebble beach and 500 metres from the larger beach where one can find restaurants and bars, where you can eat the best fresh fish, local food and wine. At distance of about 16 km there is the splendid town of Sorrento where you can find a lot of shops, restaurants, bars, discos and the theatre where you can see the Tarantella Show. From Tasso square, the main square in Sorrento, you can reach in 5 minutes by walking, the train station to go to Pompeii, Herculaneum and Vesuvius; at distance of 300 metres from Tasso square you can reach the port with hydrofoils to the Island of Capri, Ischia, Procida and Naples. The villa of 80 sq. 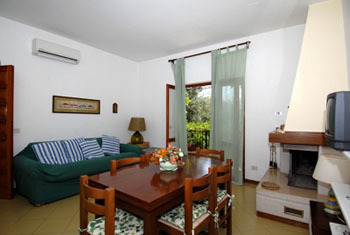 metres, comprises living/dining room with double bed settee and fire place, kitchen with cooker and oven, fridge and freezer, ample bathroom with shower, 1 sea-view double bedroom, another bedroom with a double bed (or twin) with access to a small balcony, another very ample terrace/solarium equipped with table and chairs and sunbeds, private swimming pool area surrounded by garden equipped with bardecue, sunbeds, table and chairs to eat outside. 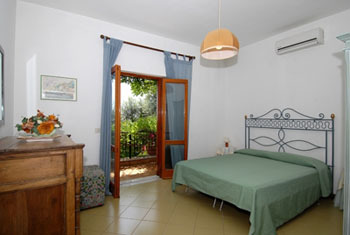 From the living room and the double bedroom you have direct access to a sea-view terrace overlooking the bay of Nerano. Sleeps 4; with bed settee 6. Water, electricity, gas, weekly cleaning and change of linen, washing machine, TV, barbecue, kettle, hairdryer, iron and ironing board, private swimming pool, private car parking. Air-conditioning and heating Euro 10, 00 per day. Fire wood. Weekly bookings are required on Saturdays. Less days on request.